Congratulations to the Monroe Academic Hall of Fame Inductees for 2016. 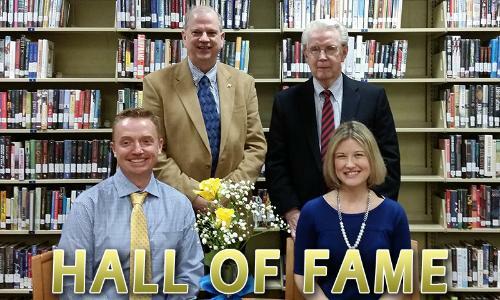 The induction ceremony was held on Tuesday March 22nd in the Monroe Auditorium. This picture was taken at the reception following the event in the media center. Seated: Rick Rothfuss, class of 1990, and Jennifer Martin Bellin, class of 1994. Standing left to right: John Birch, class of 1974, and Don Pelfrey, class of 1953. John Whittlesey, class of 1981, was unable to attend the induction ceremony. Prior to her graduation from Lemon - Monroe High School in 1994, Jennifer was active in Choir all 4 years. She was also a 4 year participant in the Blue and Gold review, which was Monroe’s way of showcasing our talented students. Jennifer was a National Honor Society member and participated in the Follies, Tennis, Thespians, and Science Club. After graduation, Jennifer attended Anderson University where she received her Bachelor’s degree in communications in 1998. She received her MBA from the University of Cincinnati in 2007. Jennifer is the Director and co-founder of Steps for Success. Steps for Success is a program to help disadvantaged high school students graduate and establish a plan for success after high school graduation through education, dedicated mentors and new experiences. She is also an active volunteer for InWord Resources, Cincinnati’s Flying Pig Marathon and Centerville Christian Fellowship Church. Jennifer has spent a great deal of time in nonprofit leadership roles, striving to make the arts accessible to everyone. She spent 7 years working with Music Teachers National Association and then continued her arts work by volunteering as Director of Public Relations for Cincinnati Opera. Mrs. Bellin currently resides in Centerville, Ohio with her husband Adam and has been employed by Paycor since 2009. She is currently the Vice President of Marketing. It is with great pleasure that I introduce Mrs. Jennifer Martin Bellin as a new member of the Monroe Local School District Academic Hall of Fame. John was a member of the Lemon–Monroe High School, Class of 1974. During high school Mr. Birch was an active member of the National Honor Society. While in high school John spent a great deal of time in activities with his youth group and in Bible studies. After graduation he earned his B.S. and M.S. in Physics from Miami University. After working 16 years for the U.S. Department of Energy, John returned to graduate school at Xavier University where he received his M.A. in Theology. His thesis at Xavier centered around the work of Dr. John Polkinghorne, who has written extensively on God's relationship to the world. John has completed all but his dissertation for his Ph.D. in Theology from the University of Dayton. He is a contributing author for a book entitled “Religious Diversity and the American Experience”. In early 2000, John was appointed by the State of Ohio Board of Education to serve on the initial School Board for the Monroe Local School District. During the initial four years the Board worked with Middletown City Schools toward the establishment of an equitable division of assets and staff. From 2000 through 2004 John served as Monroe Local School District school board liaison to the Monroe Business Council. He was elected to and began serving on the Monroe City Council 2004 through 2007. John resides in Monroe with his wife Debbie and is currently an Assistant Professor at Indiana Wesleyan University. It is an honor to introduce Mr. John Birch as a new member of the Monroe Academic Hall of Fame. Mr. Pelfrey attended Monroe Schools from first grade through his graduation from Lemon-Monroe High School in 1953. During high school Don was active in the Hunting and Fishing Club, the Tumbling Club and on the track team. He also participated in intramurals all 4 years. Upon graduation from high school Don began working at ARMCO. He started as a laborer while pursuing his bachelor’s degree in math and physics from the University of Cincinnati. In 1964 he transferred to the Middletown Works Engineering Department and to Corporate Engineering in 1969 where he led the electrical engineering team for the design and construction of the Basic Oxygen Melt Facility. Don was a contributing author for “Electric Arc Furnace Steel Making”. He joined the energy and environmental group in 1988 working with several plants on energy conservation and utility rate design. He retired after 37 years of service with ARMCO. Mr. Pelfrey is an active member of the community. He has served on the Board of several organizations including the Middletown Symphony, Middletown Fine Arts Center, Middletown Community Foundation, Mt. Pleasant Retirement Village, the YMCA and many others. The Pelfrey family is well known for their service in different capacities to the Monroe Local School District. Don has been a lifelong resident of Monroe and continues to live here with his wife Raylene. Please welcome Don Pelfrey as a new member of the Monroe Academic Hall of Fame. Rick was active in several activities during his 4 years at Lemon-Monroe High School. He was an accomplished athlete participating in both golf and tennis all four years. Rick was chosen as a participant for Buckeye Boys State and was a member of the concert band and National Honor Society. After graduation Rick attended the University of Findlay where he completed the Pre-vet program in 3 years. Rick also played tennis for the University of Findlay and was named an All-American Scholar Athlete by the National Association of Intercollegiate Athletics. Rick has a love and passion for horses that developed from spending time on his grandparents' farm. From a very early age he was determined to be a veterinarian and work on racehorses. In 1997 Rick received his Doctorate in Veterinary Medicine from The Ohio State University College of Veterinary Medicine. Dr. Rothfuss is currently licensed in Ohio, Kentucky, Florida, Delaware, New Jersey and Pennsylvania. He travels extensively throughout the states treating horses. Rick has been working for Woodland Run Equine Facility for more than 15 years. It is my pleasure to introduce Dr. Rick Rothfuss as a new member of the Monroe Academic Hall of Fame. While Mr. Whittlesey was a student at Lemon-Monroe High School he demonstrated his passion for music by participating in concert Band, choir, and marching band. During his junior and senior year John was the drum major of the marching band. Upon his high school graduation in 1981, John went on to study at Wittenberg University where he received his BA in Psychology. He later earned his Masters Degree in health administration from Xavier University. Even during his busy career in the healthcare industry, John continues his love of music. He was a member of the Boston Lyric Opera Ensemble for 19 years. He has performed at the Kennedy Center for Performing Arts, New England Light Opera, Cape Cod Opera and the North Shore Chorus. He now performs with the South Florida Symphony Orchestra. Mr. Whittlesey is the Founder and Artistic Director of Intermezzo: The New England Chamber Opera Series. Intermezzo has produced 25 chamber operas including 9 world premiers. John is currently residing in Fort Lauderdale, Florida and is the Vice President of Client Services with iVantage Health Analytics. Mr. Whittlesey is unable to join us tonight but I would like to welcome Terry Hammond who will offer some remarks on John's behalf.